"a player that used admin on the oNe server to ban Xenon twice." I will say this about that though: If undead is on new meds, his doctors have dialed it down tight. As with anything though I'm sure old patterns will return. I'm aware but I expect he'll be back, just under another alias. Going out with a ban...g.
I said before the match that Jorik would ruin it in someway. (07 Aug 12, 09:22AM)Xenon Wrote: I said before the match that Jorik would ruin it in someway. Rofl. Xenon you deserved that. for what? 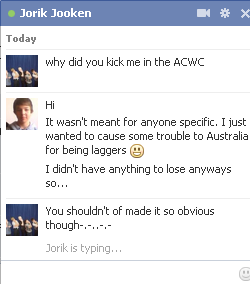 I was playing an ACWC final, no matter what grudges I had I wouldn't ruin something important like that. Jorik was allowed to play too, is that "ankward" too? And just a few Brazilians...but I guess that isn't as relevant \:D.
Not sure that would change YourSister's initial position at all. Current time: 25 Apr 19, 07:56PM Powered By MyBB, © 2002-2019 MyBB Group.